About eighteen months ago, on a flight from Boston to Seattle, I left a cherished leather jacket behind as I was going through security. When we were preparing to land, I wasn’t concerned that I didn’t have the jacket in my lap; I assumed that I had stuffed it into the overhead bin before take-off. I had taken a very early flight, as was my preference, to maximize my time on the ground that first day in the Northwest. By the time I was leaving the plane, I was anxious, and the airport authorities were not particularly helpful. It seems that the jurisdiction for lost items between the airline and the baggage handlers was murky, and a visit to the lost-and-found turned up nothing, and for good reason: I am now almost certain that I lost that jacket going through security back in Boston. And that was just the beginning. One day during that trip, I took my mom, who lives in an assisted-care facility just north of Seattle, on a drive up into the foothills of the Cascade mountains to the strangely named town of Index for lunch. The restaurant exuded rustic charm, and I tipped the waitress more than I usually do. She certainly earned it. After I helped my mom into our rental car, and I’d started the motor, and was just about to put the car into reverse, the waitress rushed out with my mom’s purse. Had we pulled out just 15 seconds later, we wouldn’t have learned of the missing purse until we arrived back at the assisted-care home, requiring a second two-hour round trip to retrieve the purse that my mom hadn’t needed in the first place: I was the one with the money. Later on that trip, on a visit to a retired professor of mine and his wife who live on a gorgeous and remote estate east of Interstate 5, I left behind my baseball cap, which I was relying on to protect my baldness from the sun’s ultraviolet rays. For the second straight day, I bounced along a former logging trail for the roughly mile-and-one-half that led to my professor’s home. Clearly, by this time, in the spring of 2015, I was experiencing symptoms of Alzheimer’s, though I wasn’t willing to believe it. The return trip to Boston was difficult. In some previous years, my brother Matt had driven me to the Seattle airport, but in this case Matt wasn’t available. I had two choices, neither of which were ideal. To guarantee that I would get to Sea-Tac in time, I would have to catch the 2:50 a.m. shuttle from Burlington, one city over from Mount Vernon, where my brother lives. Instead I chose the 4:50 bus, and I failed to fully account for Seattle-area rush-hour traffic, much worse than when I first started driving in the the Seattle area in the late seventies. Still, I was confident that I would catch my flight. And I almost did. There were just two people ahead of me when I learned that no one else would be allowed to board. The next available direct flight to Boston was that evening. What did I do with myself for the twelve hours ahead of me? I boarded one of Seattle’s gliding commuter trains, which saved me from a vast expanse of boredom at the airport. 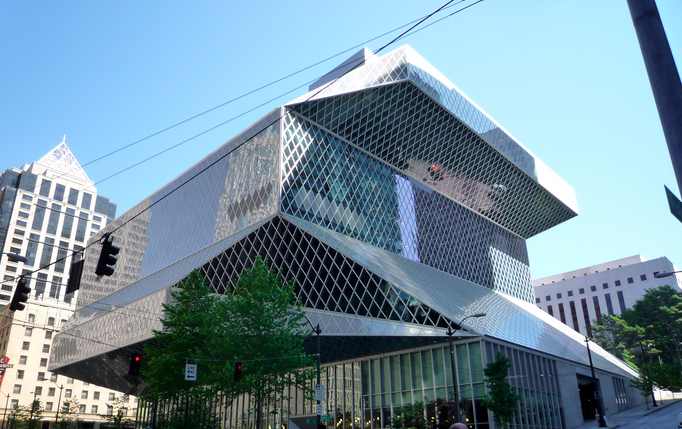 I spent a couple of hours in Seattle’s futurist library, an architectural marvel. I walked along the waterfront, with its controversial ferris wheel. I had lunch at Pike Place Market, where I gorged down an oyster sandwich, and hung out for a while in Pioneer Square, where someone was strumming a guitar. Then I rode the commuter train back to the airport with plenty of time to spare before my overnight flight to Boston. Everyone had to deplane after a half-hearted bomb threat. Most amazingly, I actually fell asleep on a plane for at least three hours without the luxury of space to stretch out over empty seats. I arrived at my home feeling oddly refreshed, despite my lack of sleep. About two months later I learned I had Alzheimer’s. The good news: In this year’s trip, I left nothing behind. 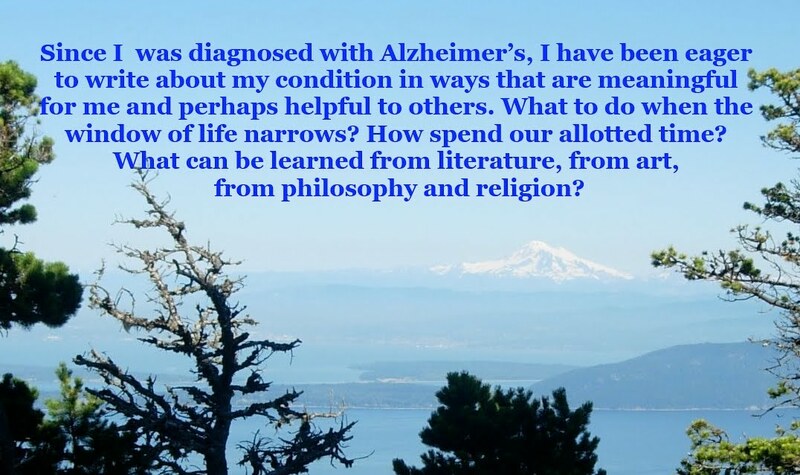 I’ve been asking myself this question in one form or another ever since I was diagnosed with Alzheimer’s. In California, doctors must report to county health departments if the driver’s symptoms are “severe enough to impair a person’s ability to operate a motor vehicle.” Massachusetts’ regulations are less clear-cut, but I understand that the writing is on the wall: My days behind the wheel are likely numbered. Last fall, this wasn’t the case. I was still occasionally driving my daughter to her school, a 28-mile round trip, and I also navigated my way on Route 128 in heavy traffic en route to an evening conference in Waltham. Returning from Thanksgiving in Rhode Island, Paula observed my driving, and I provided her with no evidence that my highway driving skills were in decline. I also had my peripheral vision tested—over time, people with Alzheimer’s are likely to experience difficulty at the margins of their vision, making driving unwise. The test I underwent indicated that my peripheral vision was fully intact. But Alzheimer’s is a one-way disease; only the pace of the disease is in question. According to my neuropsychologist, who evaluated me just a few months ago, I scored very low in areas such as attention span and short-term memory. And spatial reasoning—how to get from Point A to Point B—has always been a weakness of mine, and is getting worse. My doctor indicated that if I wanted to continue driving, I should line up a driving exam as soon as possible. But that may not be worth the trouble. In recent weeks, I’ve noticed trouble with parallel parking—an essential skill on a street where most people don’t have access to off-street parking. And, as I’ve often reminded Paula, I haven’t had an accident since October 1984, when I hit a slippery patch of dead foliage, and clipped a car’s rear quarter-panel. I’d like to keep my no-accident streak intact. And the only certain way to achieve this goal is to not drive. There is a second reason why I’m not particularly disturbed about the likelihood of giving up driving. The autumn before I first visited Boston, I spent the fall term in what was then West Germany, in the ancient city of Cologne, home of the 516-foot cathedral that bombers spared when almost everything else was flattened. My roommate and I lived with a family in a suburb on the east side of the Rhine, but the commuter-train was unfailingly on time, delivering us within a short walk to our school. Eight years later, when Paula and I were living in Hamburg, we rarely rode in a car, let alone drive one. The city’s gliding subways were so precisely calibrated that, more often than not, our wait for the connecting train was less than a minute. Sometimes the synchronization was perfect, as if the train conductors were directing an austerely modernist symphony, composed by Philip Glass. One of the many reasons I wanted to live in Boston in the first place was that the city was presumed to be the most “European” of American cities, with its graceful Back Bay brownstones, a stunningly beautiful state capitol topping Beacon Hill, the quirkiest baseball stadium on the face of the earth, a history that dates to 1630, and, as of 1984, when I first visited, a good deal of neighborhood ethnic strife, spurred by the busing crisis of the previous decade. And never have I valued my adopted city more than I do now. Technically, I don’t live in Boston. Paula and I reside in neighboring Somerville, which, with roughly 79,000 residents in 4.1 square miles, is one of the nation’s most densely populated municipalities. I can walk to Harvard Square in twenty minutes, but I am rarely aware when I’ve crossed the city boundary—many homeowners and businesses pay property taxes to each city, on a pro-rated basis. There is no other place where I would rather live. This is not a recent sentiment. I’ve felt so for years, but nowadays I have another reason to love the city. I know it intimately. Brisk walking is one of the ways I get my exercise—bicycling is another—and so long as I stay within familiar territory, there is little chance that I will lose my way. Note: I will be on vacation for much of the next two weeks, and this will be my last blogpost until at least Friday, September 30. I hope to post fresh material within the first several days of October. Also: On Sunday, Sept. 25, Paula will be participating in the Walk to End Alzheimer's. People were very generous in sponsoring me in the Ride for Alzheimer's research in June. If anyone would like to sponsor Paula in her walk, please visit my Facebook page for a link to the donation site. Five-plus years ago, on one of my visits to my hometown of Bellingham, Washington, where I also attended college, I encountered one of my old professors at the local supermarket. His name was Hugh Fleetwood, and his son Seth, now an attorney and former member of the City Council and the Whatcom Council Council, was one year behind me throughout school. In 1981, my freshman year at Western Washington University, I enrolled in Professor Fleetwood’s Introduction to Philosophy course. Did that course totally change my life? No, but it did expand my horizons. I’ve often recalled that course for its intellectual rigor. Was free will an illusion? Did one cause lead to another, ad infinitum, throwing into question the existence of the self, let alone a soul? Was Descartes correct, that the most compelling proof of his own existence was that he was capable of doubting it? I had no great knack for the conundrums of philosophy, but just the fact that people had argued about such questions for so many centuries stimulated me. After the course ended, I received a letter from Professor Fleetwood, urging me to consider majoring in philosophy. My dad was so flattered on my behalf that he mimeographed the letter and sent copies to our relatives. Neither my parents nor I grasped that the likely reason I received the letter was that the number of philosophy majors was dwindling. I myself was setting out on a more practical double major in journalism and political science. Most of my poly sci professors had come of age during the 1960s, and almost all of them were on the political left. Being moderately conservative at that age, I sometimes argued with my professors. During the fall of my junior year, Professor Fleetwood became a controversial figure, at least among student activists. Over the expanse of decades, the details have grown hazy, but one quote from him, uttered in the Faculty Senate, has stayed with me: “Students are not a particular font of wisdom.” Or some other version of the same sentiment. From the uproar that ensued, you might have thought the professor had said that students shouldn’t be allowed to speak at all. He also noted, in a letter to our student newspaper, that the word in question was font, not fount. In 1982, not long after the dawn of the PC revolution, I had no idea what a font was. I don’t think anyone did. In any case, I editorialized in Professor Fleetwood’s favor. In March 1984, I graduated from Western a quarter early, the better to position me to get my first professional newspaper job. It was in Waterbury, Connecticut. A year-and-a-half later, I moved to Boston. There was no likelihood that I would ever see Professor Fleetwood again. But there I was, on my annual trip to Bellingham, in what I believe was the spring of 2011. And there was he, looking, for lack of a better term, demented. He was leaning unsteadily against his shopping cart. Only later did I learn that his disease was Parkinson’s, not Alzheimer’s—not that the distinction would have meant much to me back then, when I expected to live to at least 86, the age my dad had achieved. There was a fleeting moment when I could have done the gracious thing: Greet him, lay my hand on his shoulder, tell him how much I appreciated his philosophy course. But I suffered a lack of nerve. There was no possibility that he would have recognized me—by 2011, I scarcely resembled my twenty-year-old self, he had taught thousands of students, and his disease had done its dirty work. But he might have remembered my name, once I stated it. Perhaps I could have expressed my gratitude for helping me widen my intellectual ambitions. But I soon realized that I had flunked the moral philosophy exam. Professor Fleetwood, I recently learned, died a few months later. In a recent article in New York magazine, journalist Benjamin Wallace described a new kind of aspiration to immortality, one achieved through the pharmaceutical breakthroughs in the years since the human genome project was fully mapped in 2003. The article focuses on Leonard Guarente, a biologist who directs MIT’s AgeLab and cofounded Elysium Health, and is a strong proponent of the notion that longevity, through science, could stretch a good deal farther than most people assume. As described in Wallace’s article, Elysium Health has developed a “daily health product designed to optimize support for your most critical metabolic systems.” The claims include helping people with several chronic diseases, including Alzheimer’s. As Wallace put it, the Elysium brand “began pummeling my awareness for weeks, the ads barreling into my Facebook feed with claims of being the world’s first cellular health product.” “Cellular” suggests that the proposed therapy would work at the level of individual cells, rather than in the brain only. What is particularly noteworthy is that the company bypassed the Food and Drug Administration, “effectively using its customers as human test subjects, sometimes reviewing their FitBit and other health-tracking data to determine if the pill delivers on its promise—or causes unexpected problems.” Wallace himself took part in the trials. “If I were going to trust anyone in a lab coat promising a magic pill to stay healthy longer, Guarente appeared to be a good bet. As the month’s end drew near, I was reluctant to stop taking Basis,” the drug in question. “But what promise!” Wallace exclaimed, predicting that in the next five to ten years, today’s research will bear fruit. He noted that while people won’t necessarily live longer, they might live better, suffering fewer of the consequences of aging. Last fall I attended a forum on aging, and the figures cited on longevity were similar to what Wallace describes—the world’s oldest woman, who died at 123, was highlighted. Also noted was that babies being born last year are expected, on average, to live over 100. But the speakers had little to say about how degraded our planet will have become, if current environmental trends continue. This led me to reflect on two works of the imagination, one a movie from 1973 starring Charlton Heston, Soylent Green. The fictional year is 2022. The authorities keep a tight lid on rioting, and most of the population is miserable in their global-warming-run-amok climate. More relevant is the recently published book by Don DeLillo, one of the most critically acclaimed novelists of the past three decades. To read DeLillo at his best—and his new novel, Zero K, is one of his best—is to perceive reality as it might be just around the corner. The cryonics business—the dream of suspended animation—is flourishing in out-of-the-way places. This is not science fiction; better to think of it as a preview of the near future. In this book, DeLillo’s obsidian-sharp prose is at its best. A key plot point, which I won’t divulge, floored me. And DeLillo is the only writer who could have pulled it off.